Have you ever been so in love with a movie, you wished that you could step through the screen and walk around in the locations, interacting with the movie’s characters while you lived — albeit temporarily — in the unique environments? And clearly, we’re not alone. Because nowadays, there are new exhibits attached to specific movies that aim to bring audience members deeper into the experience of a film. IMAX has done standups in lobbies of movie theatres. RealD 3D creates events to bring patrons into movie scenes. 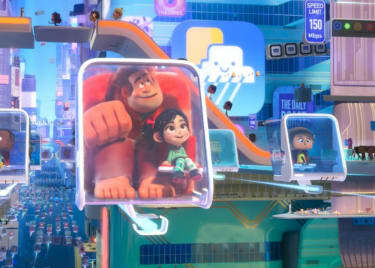 And now, RALPH BREAKS THE INTERNET is using virtual reality as a means of plunging lucky Disney fans into the animated world of Ralph and Vanellope. 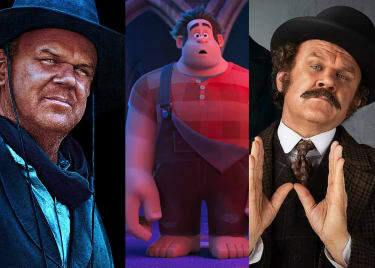 At a recent event outside of Los Angeles, we were able to preview “Ralph Breaks VR,” an interactive exhibit that uses virtual reality to allow you to walk through original scenes inspired by RALPH BREAKS THE INTERNET. Have you dabbled in VR yet? The image that pops into your head might be the characters in Steven Spielberg’s READY PLAYER ONE as they enter The OASIS. And you’re not that far off. But even if you have sampled VR before, it’s unlikely that you have experienced anything quite as immersive and playful as “Ralph Breaks VR.” After a brief video introduction from Ralph and Vanellope, this VR activity takes patrons through a physically constructed maze, and you feel like you are walking through scenes from the new Disney movie. 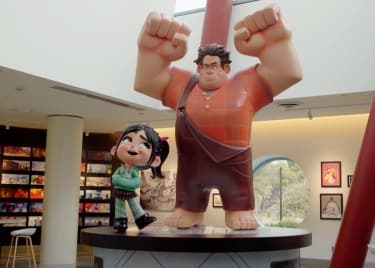 “We definitely made the choice to say this is its own experience in its own world that you can go and hang out with Ralph and Vanellope and live out a few dreams you didn't know you had until you get there,” says RALPH BREAKS THE INTERNET co-writer Pamela Ribon, who contributes to the dialogue in the VR exhibit. The VR covers several aspects of Ralph’s internet trip. In some spots, you are standing in a kitchen firing pancakes and milkshakes at fuzzy kittens and bunnies. But in other spaces, you actually feel like you are on a moving train that’s shuttling you through online video games and worlds. It’s hyper-realistic. “Ralph Breaks VR” is an immersive exhibit that, for now, you need to travel to in order to experience. It requires the presence of the physical maze through which to walk, and the organizers have avatars that allow you to assume the identity of the Netizens — citizens of the internet who are important to the movie — so this isn’t something that can be replicated in your home. But it was cool to see the ways that technology is shaping and expanding on the moviegoing experience, allowing you to take the viewing event of a movie like RALPH BREAKS THE INTERNET to the next level. Imagine what will happen when the same creative ideas are applied to worlds like STAR WARS, FANTASTIC BEASTS or the Marvel Cinematic Universe. 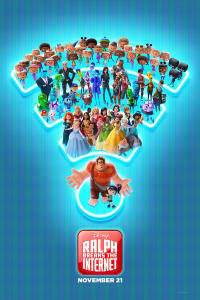 See RALPH BREAKS THE INTERNET at your local AMC. Get your tickets today.